Tuesday, July 10, 2018, 6:30 – 8:30 p.m. 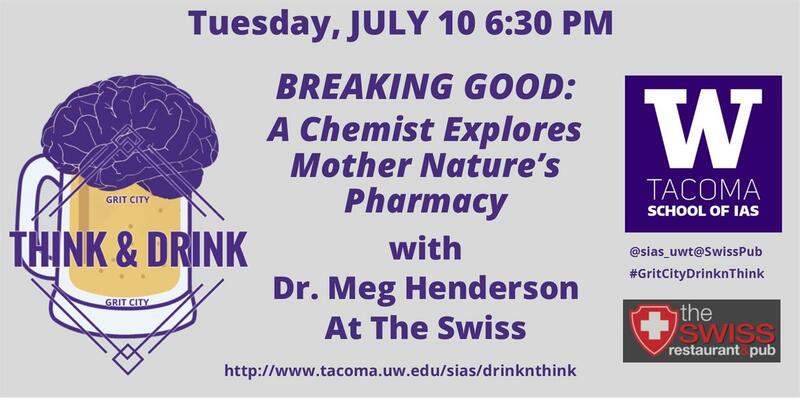 Breaking Good: A Chemist Explores Mother Nature's Pharmacy with Dr. Meg Henderson, UW Tacoma. The history of humans is inextricably interwoven with the story of plants; humans have long depended on plants for everything from food, fuel, shelter, and oxygen to medicines. This talk explores the interesting plants found in medicinal gardens and the role of the chemist in isolating and identifying drugs from plants by highlighting the stories of three important natural products chemists. At UWT, the isolation and identification of medicines from plants was used as a mini-research project to introduce students to real-world research, and the value of these projects will also be described. Margaret Henderson is a Lecturer in the Science and Math Division at UWT. She teaches Organic and General Chemistry. Her interest in natural products chemistry led to attending a week-long seminar in the “Chemistry of Medicinal Plants” at Tuskegee University in Alabama last summer. This experience grew into a set of mini-research projects with her Organic Chemistry students this year.